Are the rates reported on ProZ based on source or target word? But it does not say whether that is for source or target word. As I am a CN>EN translator, this is kind of important, because there tends to be a big difference there in word count. I would guess counts are based on source words, but it certainly makes a difference. Fifteen years ago, one agency I worked for paid 0.85 Danish Kroner for 1000 source words from Danish to English, or 0.72 for English target words. A little earlier, they had been keeping careful statistics of time taken and words translated, because they had changed over from counting target words (which were always available electronically) to counting source words. They were aiming at paying the same for the same job, regardless of whether they counted source words or target words. I do not know any more details, but there can be a 20-25% difference between Danish and English, and I always argue that Scandinavian languages are not unreasonably expensive at 1200 English words for 1000 Scandinavian... and from Finnish or German you get even more. You definitely need to take that kind of thing into account. and volumes (i.e. lines) are based on target, at least in my experience. I happen to see that translators that translate into more than one language like i.e. English and German, charge the same per word source. So, at the end of the day, if they have translated from German, they have earned at least 25% less than the other way round. This is quite astonishing and not very wise, commercially speaking. Thanks for your answers folks. They are helpful. I prefer quoting based on the source text. However, ProZ. 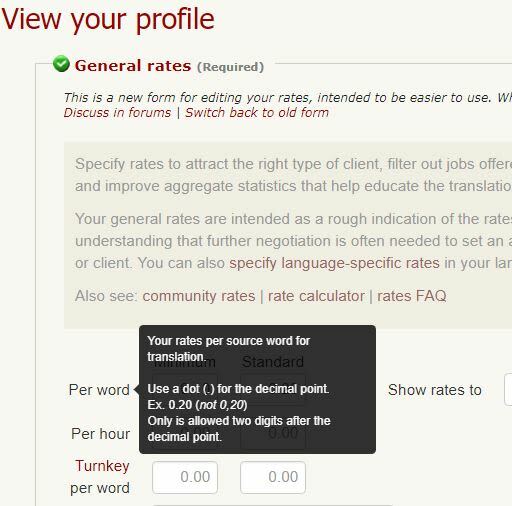 still does not allow us to specify rates in "per character" units (only word and hour can be chosen). This is a huge problem for languages where "word" does not have a meaning, for example Japanese. Hungarian is also often counted in characters, especially by some of the agencies in Hungary. I have been asking for "character" to be available as a unit for ages. ProZ put "character" into the job quote form as a unit choice, but not into our profiles and not into the directory search. As an alternative, I could use "per word" rate, but that would be target word - going from Japanese to English the source would be counted in characters, but the target would be counted in words. At this point I have no other choice but use the "per word" option, and put in my target per word rate, which is misleading in many cases, because it does not say "target". The multiplier between the two figures (source character rate vs. target word rate) is 2.5 (because this is how these two languages work), so it is very significant. I am baffled why this has not been resolved yet. those pairs if need be. " And that is what happened, a few days later when I logged out and logged back in, a pop-up window told me to check and reset my rates for Japanese source text. I am writing this here to let people know, because even after several days that this was done, I did not see any site-wide announcement anywhere. I saw the pop-up without logging out and in again. I just loaded up the site in a new browser window one morning (still logged in) and got the pop-up.